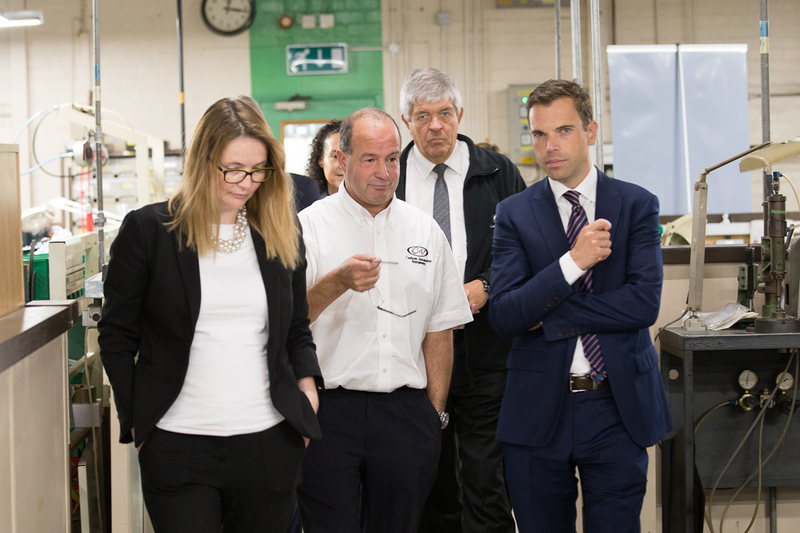 Ken Skates AM, the Welsh Government's Cabinet Secretary for Economy and Transport, and Kirsty Williams AM, Cabinet Secretary for Education, had a tour of the Caerbont Automotive Instruments (CAI) site on 27th September 2018. During the visit, Gavin Roberts, CAI's Managing Director, explained the need for additional or new manufacturing space following a sustained period of sales growth in the UK and overseas. Welsh Liberal Democrat Kirsty Williams first visited CAI in April 2018 when she was introduced to two of the company's apprentices, including Amie Guy and Amanuel Gebretnsae. On a factory tour, the Cabinet Secretaries were shown how CAI design and manufacture gauges for the automotive, motorcycle, marine and aviation sectors. The gold-plated tachometer designed and built for the new re-imagined Porsche 911 produced by Singer Vehicle Design proved to be of particular interest. Ken Skates and Kirsty Williams were also shown a recently acquired FOBA M-Series laser etching and marking machine. The new equipment was one of many new initiatives being implemented at CAI to allow us to innovate in new designs and to improve existing processes. This was enabled by the Welsh Assembly Government ERDF 'SMARTCymru', grant and support from HSBC. SMITHS Instruments has been manufacturing gauges in South Wales since 1949. In the 1980s, the automotive instrument division of SMITHS was sold, first to Lucas and eventually to the factory employees. CAI continue to manufacture classic SMITHS instrumentation for some of the most famous cars and motorcycles ever produced including the Aston Martin DB5 and Triumph 6T Thunderbird motorcycle. In recent years, the CAI design team has worked with Jaguar and Aston Martin on the re-release of classics such as the Jaguar XKSS. CAI also design new instrumentation for luxury motorbikes such as Midual Motorcycles and aviation gauges for the new Dragon Autogyro released by Chimera Aviation. "We have experienced a sustained period of growth because of our expanding range of gauges in the classic market, new instrument projects and entry into new market sectors" explained Gavin. "As sales have expanded, we have increased our workforce and invested in apprentices. However, our continued growth is limited by the condition of our facility in Abercrave. We are assessing our options, which we wanted to discuss with Ken [Skates] and Kirsty [Williams]." The automotive industry is identified as one of the four major manufacturing sub-sectors in Wales. "CAI and SMITHS has such a rich history in South Wales," said Gavin. "The support of the Welsh Government is so important in the future development and expansion of our business. The visit by the Cabinet Secretaries is greatly appreciated and allowed us to showcase our company. Their feedback was really positive and we are looking forward to further discussions in the near future." You can also follow us on social media including Facebook (@caigauge) and Twitter (@caigauge) for regular news and technical updates.